This is a photograph of Jupiter on 1/3/12 at 19:55 PST. 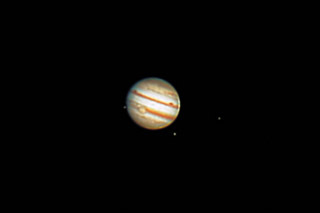 The Great Red Spot is prominent in this image, as well as 3 of its moons. From left to right, these moons are Europa, Ganymede and Io. Notes This is my first good image of Jupiter using my new 450D with Live View to capture video. I was very pleased how well it worked, although my laptop is only capable of capturing about 10 frames per second. I still need to learn more about processing planetary images, but this seems like a good start.